Ever wonder how I or other workshop leaders put together our trips? Come with me to Ladakh, India and find out! This trip is a scouting mission for my 2019 workshop there. I usually do these trips alone, but this time I'm looking for a few (1 - 3) adventurous souls to join me. Fair warning, this is the trip where I find out if the light at the monastery is better at sunrise or sunset, if the lodgings are up to snuff, whether the planned route from point A to point B is reasonable in the allotted time. In other words, we might arrive at the exact right place at the exact wrong time. If you can't handle that level of uncertainty, this trip is not for you. Also, I cover a lot more ground and work longer hours than I would ever consider scheduling into a group tour so you have to be in reasonable physical condition to keep up with the pace. On the other hand, if you value adventure, discovery and welcome the thrill of the unknown, let's talk and maybe we can check one off the bucket list together. Another benefit of the small group size is that you will receive a lot more personal attention than is possible with a larger group. Just about every Indian that mentions Ladakh calls it "heaven on earth." I've never been, but mountains are my thing and they don't make mountains any bigger or wilder than the Himalaya, so I have a good feeling. 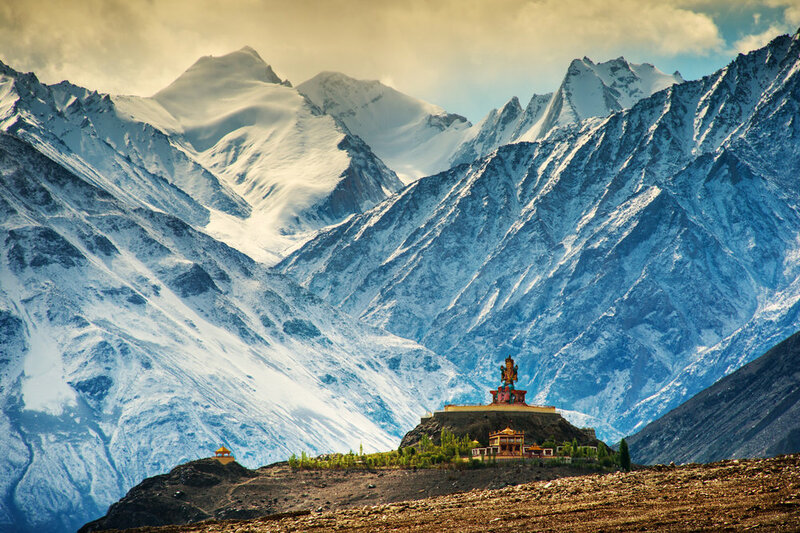 Ladakh is a region in the northern Indian state of Jammu & Kashmir. The history, people and culture here are closer to Tibetan Buddhist than the rest of Hindu dominated India (see my Tibet gallery to get an idea of the faces and places we are likely to encounter). In addition to the Buddhist influence, this region is home to several ancient indigenous cultures. Click the itinerary tab for more detailed information about our daily schedule but be advised that this may very well change due to weather, road conditions or any number of other reasons. . The price for this trip is $3995 based on double occupancy. Single room supplement is $500 additional. Prices include meals, lodging, photography instruction and all travel inside India. The trip begins and ends in Delhi, India. Prices DO NOT include airfare to/from Delhi. We will be staying in comfortable but basic accommodations and will include one or two nights of tent/yurt camping. There is one round trip domestic flight (Delhi-Leh) included. All other transportation will be by car/van with a professional driver and local guide. What's Not Included: Airfare to/from Delhi, trip insurance, gratuities, personal expenses, Indian tourist visa. READY TO JOIN THE ADVENTURE?